Dr. Jeffrey Schreiber, a Baltimore Plastic Surgeon explains that Micro-needling P.I.N. (Percutaneous Induction Needling, also referred to as PCIT, Percutaneous Collagen Induction Therapy… a.k.a. micro-needling, or automated micro-needling) is a method of introducing a controlled wound into the skin triggering a release of natural growth factors, new collagen & elastin. 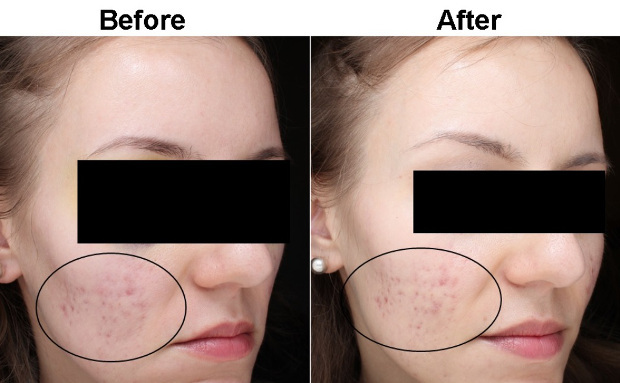 This Baltimore facial rejuvenation process causes much less damage to the epidermis than dermal rolling or dermabrasion which helps to protect the new skin cell growth providing for faster healing and a much higher success rate for overall and longer lasting results. Micro-needling is a new innovation in cosmetic medicine for the treatment of fine lines, acne scars and improvement of the skin’s overall appearance. During this procedure, tiny needles are used to create controlled micro-injuries to the skin in order to produce collagen and elastin. The skin’s repair process results in a thicker dermis with the appearance of softer wrinkles. Automated micro-needling also creates superficial micro-channels, which allow topical serums and creams to be absorbed more effectively into the skin. Collagen P.I.N. is the most advanced medical-grade automated micro-needling device on the market. Micro-needling rollers are the previous generation of needling devices. One of the many drawbacks is that dermal rollers have a fixed needle or penetration depth (i.e. 0.5mm), which is not very conducive when treating an area like the face which requires different depths due to the thickness of skin tissue, which varies in depth tremendously depending on the area being treated. Therefore, having a fixed needle depth or penetration level is a huge drawback when trying to customize a treatment for consistency. Collagen P.I.N. ™ has an adjustable needle depth that allows your Baltimore cosmetic surgery specialist to vary the depth of penetration throughout the entire treatment. This will allow the medical provider to properly address the specific needs of thinner skin on your lower eyelids, crow’s feet, and forehead. Additionally, where the tissue is thicker in other areas like the upper lip, cheeks (due to fat pads), and neck the necessary adjustments can easily be treated with 1 needle tip instead of 5 or 6 needle rollers. The other dramatic difference is in the type of injury that occurs using the Collagen P.I.N. verses a Dermal Needling Roller. Most Collagen P.I.N. ™ patients have a healthy pink glow immediately after the procedure, which lessens dramatically within 24 hours or less. Most patients are back to work the same day and out to dinner the same evening and experience little to no down time. A sterile needle-tip containing 12 tiny micro-needles is attached to the Collagen P.I.N. ™. Your Baltimore plastic surgeon expert will apply a thin layer of topical serum to your skin and select the appropriate treatment depth based on your unique needs. Next, in a single motion, the Collagen P.I.N. will be gently glided across the skin in one direction until the entire treatment area has been covered. This results in thousands of microscopic channels throughout the entire treatment area. Schedule your procedure today at www.BaltimorePlasticSurgery.com or call (410) 205-1846.